On October 8th, 1953, a small group of conservation minded pioneers, all who shared a common love for the Miramichi and who feared for its future, registered a fledgling new organization called the Miramichi Salmon Association, Inc. (MSA). The group, made up of anglers, guides, camp owners, commercial outfitters and sporting good merchants, drafted a simple and somewhat optimistic statement that declared as its mission; “the propagation, protection and perpetuation of the Atlantic Salmon in the Miramichi River system”. Sixty-five years later, that fundamental goal still directs the programs and activities of the MSA. The MSA has accomplished much over the past 6 decades. Through the persuasive voice of Jack Fenety, MSA President for 35 years, an intense lobbying effort was conducted to reduce bag limits on Atlantic salmon anglers, ban the angling for salmon from bridges, establish the mandatory use of flies only for angling salmon, create closed fishing zones in the headwaters to protect spawning salmon and ban the commercial net fishing for salmon. Under the leadership of Mr. Fenety, the MSA sponsored the reconstruction of the federal salmon hatchery in the early 1980’s and later under the leadership of President Bud Bird, the MSA took over the operation of the facility in 1997. 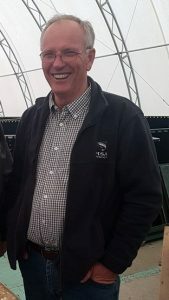 By 2000, the MSA hired a full time President, Mark Hambrook, to run the hatchery facility and to start an aggressive campaign to halt the decline of salmon stocks, first by inventorying the number of young salmon (smolts) migrating from the Miramichi River to the ocean, counting the juvenile salmon in the river and targeting the low density areas with salmon stocks from the hatchery. In addition, public awareness programs were conducted to explain the plight of the wild Atlantic salmon, with an emphasis on educating children; the future custodians of our environment. For a more complete outline of current MSA conservation activities please visit the Programs section of our site. Strides were also made in working with the two local Miramichi First Nations to bring employment to the people and lessen their dependence on catching salmon for food. The MSA now hires many of its seasonal employees from the local First Nation communities. In its 65th year, the MSA has grown to become far more than just a group of salmon anglers, and far more as well than just a home-grown community loyal to their favourite river. 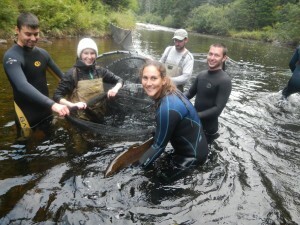 The MSA has become and continues to grow as a leading ‘on-the-river’ conservation organization, whose vision surely resonates with all; that our great natural capital – the river and the salmon – can be cared for and enhanced so that their natural health and abundance can be increased and perpetuated in value for the long term future to come. Please join our conservation effort by becoming a supporter today.